The electro-hydraulic power unit Dyno is the ideal tool for tire and maintenance truck shops, road and field services for trucks and heavy duty vehicles, infrastructures, railway applications. The electro-hydraulic power unit avoids all the inconvenients linked to compressed air: residual water in the network, lubrication of the engine and energy waste when the tool is not in use! Moreover, a 7 kg impact wrench fed by an electro-hydraulic power unit reaches the same torque as a pneumatic 9 kg impact wrench. Equipped with handles to ensure easy transportation, the Dyno, thanks to the selector for the inversion of phase, can be used on any electrical outlet. Moreover the low voltage electrical control allows the maximum operator safety. The hydraulic impact wrench, supplied with just 2 flexible hoses, is available in two models: the DPH EVO 340 with ¾” square drive and the DPH EVO 341 with 1″ square drive. Both models are available in short and long anvil versions. The impact wrench reaches the maximum torque of 3000 Nm on loosening allowing the use even on the most resistant nuts. Thanks to the torque control system, the tightening torque can also be adjusted from 300 to 2800 Nm with a 5% accuracy. 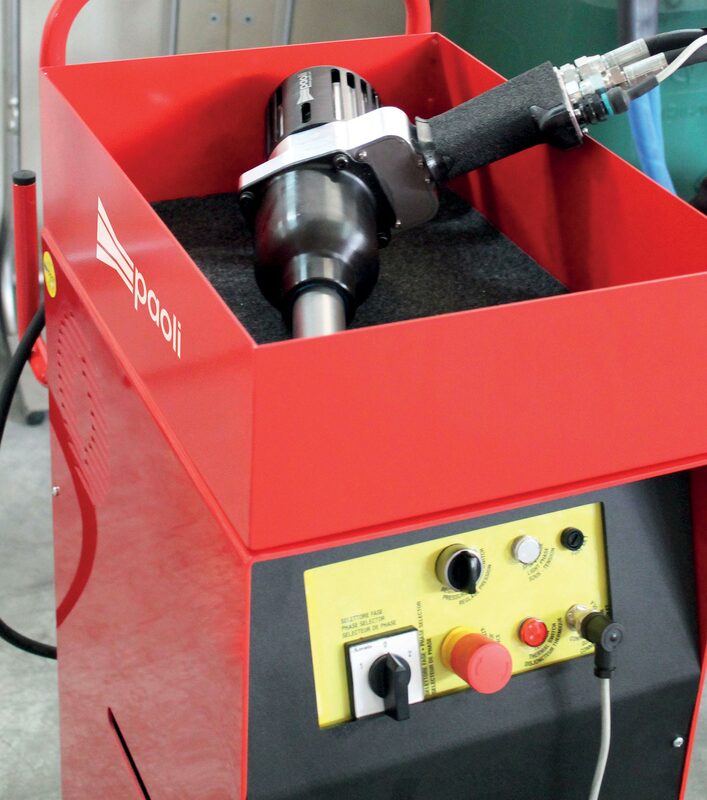 Each Dyno kit includes a power unit, an impact wrench and a standard 1,5 m hose. Dyno: the perfect electro-hydraulic power unit when no air supply is available. We inform you that we will show our new products at SEMA Show 2018 from 30 October to 2 November 2018. You will be more than welcome at our Booth 10172 – North Hall – Section: Tools and Equipment. We would be grateful if you could confirm your visit to our booth by writing us, within October 23rd, at: sales@paoli.net. Should you need more information, please do not hesitate to contact us. The Iron mobile workstation has been designed to assure the workers a comfortable and ergonomic seat. The operator, using the built-in suspension system in the arm, doesn’t need to hold up the impact wrench while using it. The trolley has wheels, in order to allow an easy transportation. The combined use of the Iron and of the DP246 Paoli impact wrench is the perfect solution for trucks and heavy duty vehicles. Thanks to the pin-clutch hammer mechanism with oil bath lubrication system, the DP246 model ensures less maintenance and improved durability of the impact mechanism. Moreover the Iron FRL group provides the direct lubrication of the impact mechanism without the operator intervention. Moreover, the exhaust air system of the impact wrench was created to ensure the total absence of harmful powders. The updated version of the catalogue completely dedicated to automotive and industry range is here! The 2018 edition has been enriched with numerous products and accessories. The range of Paoli impact wrenches includes new models such as the compact and efficient Butterfly, the super-powerful DP1800 Plus, the light but strong DP3450, the modern and powerful DP3500 and the DP3800 with an excellent power-to-weight ratio. Among the ecological trolleys, you can find the Mobile Working Unit, which represent a return to Paoli tradition with a touch of innovation, and the new trolley designed to easily support and transport articulated arms. The DPLIFT section, completed with detailed descriptions and updated images, now presents a new subdivision by type and an introductory scheme that allows to easily identify the most suitable solution to your needs. The new set of super thin wall impact sockets, characterized by a 1/2″ square drive, increases the Paoli accessories range. Designed specifically for alloy wheels, it is composed of 17, 19 and 21 mm hexagonal sockets, quickly identifiable through appropriate color codes. Download the 2018 Paoli General Catalogue! The experience in Paoli Motorsport field (result of constant technological research and collaboration with the best teams in the world) has allowed us the development of our impact wrenches also in the automotive and industry sector; mostly in reliability, precision and durability. Our impact wrench DP160 inherits from the racing skills not only the know-how but also the design in motorsport perfect style. The model DP160, available with short or long anvil, has a 1″ square drive and a bolt capacity of M16-M30. It has a 3-jaw hammer mechanism, it weights only 5.6 kgs and it has a max torque of 1900 Nm. This model, combining weight and power, is the ideal solution for an industrial use without the need for supports. The high quality of our products as well as the continuous research of solutions responding to our customers needs are Paoli’s keys to success both for Motorsport and Automotive. The constant innovation and investments made in R&D for Motorsport allowed us to develop safe, performing and longlasting impact wrenches suitable for the automotive and industrial fields. This is the case of our DP251, whose restyling 2018 is the result of the know-how developped by cooperating with the main racing teams and of the cutting edge technologies introduced in Motorsport. The implemented performance reliability and the perfected 3-jaws impact mechanism make the DP251 a powerful, extremely precise tool and ranks it at the top of its market share. Designed for heavy vehicles purposes, it has a 1 inch square drive and M18-M39 bolt range. It’s featured by black anodized aluminium and grease lubricated, it weighs 9 Kg. The professional pneumatic impact wrench DP251 is also available with long anvil and in Atex version, specific for mines, oil fields and shipbuilding. The professional pneumatic impact wrench DP246 was born from Paoli’s experience to provide customers with a light, durable and technologically advanced tool. Today’s new version is even more performing and resistant with 1″ square drive and bolt range M18-M39. Our DP246 is equipped with the innovative pin-clutch hammer mechanism with oil bath lubrication system and featured by its Ergal aluminium front cover and low vibrations. Its maximum torque is 2796 Nm and weights 8.2 kg. Long anvil version is also available. The DP 246 impact wrench is the perfect solution for trucks, buses, tractors and any industrial assembly. From Paoli’s experience and its cutting edge sectorial engineering research a new wheel gun is born: Hurricane. The partnership with highly skilled technicians and the most important racing teams has allowed the development of an innovative, greatly performing and technologically advanced product. Optimizing the pressured air fluid dynamics, thanks to a CFD (Computational Fluid Dynamics) study, has permitted not only to sharpen the engine performance, but also to create an unique, fresh and well-finished design. Care for the details reveals itself also in the use of new technologies in the production area, such as the lost wax casting, intended to assure the internal channels dimension repeatability and to guarantee homogeneity in performance. Hurricane performance on loosening has increased by 10%, while on the tightening side it has remained intentionally unchanged compared to the previous models, in order to avoid excessive tightening. Moreover, the new Hurricane is suitable for the new Fast Shift: a lever system which allows an immediate side reversal and to save a remarkable amount of time between the removal of the old tyre and the installation of the new one. Lastly, the selection of materials such as carbon, aluminum and aeronautical steel makes Hurricane a fast and extremely reliable wheel gun. Discover the new Hurricane with Paoli and United Race Parts! It is not easy to race in Le Mans: the French circuit is, for each team, a challenge in terms of competition, reliability and resistance; in addition to being one of the most insidious test bed for errors and inconveniences. The 2017 edition of the endurance competition has been held on June 17th and 18th at the Circuit de La Sarthe, Le Mans: Cetilar Villorba Corse and Dino Paoli were there. The debut of the Treviso-based team has been a magic moment: a dream came true, bringing the Italian colours on the podium, together with the Dallara P217 and the pilots Roberto Lacorte, Giorgio Sernagiotto and Andrea Belicchi. The team, at its debut on the most famous and legendary endurance race, has settled the endeavour with a great result, gaining the 9th final place. Their technical partnership with Dino Paoli has allowed them to give birth to an entire “made in Italy” project: a choice that has proved itself to be winning during the third round of the Endurance World Cup. The Italian excellence and distinction, high quality technology and expertise of the two companies have strengthened and brought to success the “Italian Spirit of Le Mans”. Competitiveness, show and pure adrenaline. Indianapolis 500, one of the most famous car races of the year, has been held at the oval-shaped Indianapolis Motor Speedway on May 28th. The appointment, highly awaited by many enthusiasts and supporters, has been preceded by several events and tests which got the circuit heated. Carb Day, the extremely followed final free practice session happened during the earlier Friday before the race, followed by the TAG Heuer Pit Stop Challenge: a competition in which several teams challenge themselves to establish the fastest one to complete a pit stop. Team Penske, one of the ten teams competing, has won this year title for the 17th time. Paoli and United Race Parts were there, and we decided to reward the winner with a special golden version of our DP 6000 RH wheel gun, and each team with a Indycar service kit. Paoli and United Race Parts also provide the teams the possibility of customizing the wheel guns liveries. Tequila Patron Extreme Speed Motorsports, a team competing in the 2017 IMSA WeatherTech Championship, uses for its endurance races in the US a Paoli DP 4000 MG UH black and green model, tailored according to the team colors. Paoli and United Race Parts: Pit Stops at full speed. The 27th edition of Autopromotec has just closed its doors. The biennial exhibition of equipment, machineries and products for the Automotive industry has been held in Bologna, Italy, from May 24th to 27th 2017. The event, highly awaited from the field professionals, has registered more than 110,000 participations, earning a national and international success. Paoli couldn’t miss the appointment, so we took the opportunity to present our 2017 General Catalogue and the newest accessories range, developed to accomodate the customers and users necessities. Paoli’s General Catalogue has been entirely redesigned in contents and graphics: an immediate and functioning design, an easy to use layout and an intuitive subdivision in sections make the new issue an user-centered and useful tool. In order to supply an accurate service and thorough informations to the readers, every product has its own detailed info sheet where, in addition to the technical data and informations, are reported related accessories, available kits and package content. The accessories section has been renewed and enlarged, with the update of the existing products and the introduction of the new items, such as compressors, electric screwdrivers, Caseliner equipment and Checkpoint safety indicators. Download the 2017 Paoli’s General Catalogue and discover the new Accessories section! The Le Mans 24 Hours Moto is an essential appointment for Endurance enthusiasts. The unique charm of the Bugatti circuit and the long tradition of this event attract more than 150,000 spectators and supporters every year. The 40th edition of the event has been held on April 15th and 16th, and Paoli was along the SRC Kawasaki Team, with whom the Italian company has signed an important partnership for the current year. This settlement with the French team, which races in the FIM Endurance World Championship, shows Paoli’s participation in the two-wheels world and in the endurance motorcycle competitions. During the weekend, the SRC Kawasaki team, composed by De Puniet, Foret and Gines, has obtained great results, achieving the third step of the podium. A great success, outcome of work, commitment and passion. Start your engines: with Paoli and SRC Kawasaki the season is at full throttle! The new Tyre Scraper is here! More efficient and effective, the new Tyre Scraper TS-03 is the ideal solution to extend the life of tyres. It allows to remove irregularities and debris from tyres without damaging the compound with inadequate tools and excessive temperatures. Born from the Greaves 3d Engineering experience, the Tyre Scraper has been redesigned in order to ease the operator’s’ work and make it faster. The new shaped handle and the blade position make the usage more comfortable, increasing at the same time the performance. The built-in heat gun is fitted out with a variable temperature range (100-600° C). It is also possible to program the fan speed, reducing the operation time on the tyre surface. The new Tyre Scraper is recommended for use in all motorsport environments, from karting to F1. Always performing tyres with Paoli and Greaves 3d Engineering! In Paoli, we love to offer to our customers the most excellent technological solutions and the best-performing tools in every situation. It’s from this attitude that comes Dyno: Paoli’s hydraulic revolution. Dyno is part of a range of hydraulic products, which have the goal to please every client’s implementation needs. Available for different voltages, Dyno is composed of an hydraulic wrench and an electrically operated control unit. When an air supply is not available, Dyno becomes an irreplaceable work tool. Essential for outdoor support operations, it is fitted to be used in construction sites, moving workshops, infrastructures maintenance and roadside assistance. Dyno is perfect also for tyre specialists, repair shops and situations where all the air supplies are already being used by other tools. Furthermore, thanks to the heat sink, which brings out the heat generated, it is ideal for the use in harsh climatic conditions. Paoli’s experience and know-how has led to the development of a revolutionary hydraulic wrench with hammer mechanism. The oil pressure regulation allows to obtain an accurate and clear torque control. The torque range can be set from 300 to 3000 Nm while tightening, whereas while loosening it is possible to employ the maximum power even with particularly tricky nuts. The Dyno system is convenient and easy-to-use: it is sufficient to connect it to an electrical outlet or to a power generator. The power supply system, only composed of two whip hoses, is extremely manoeuvrable by the user. The lateral handles enable an easy carriage of the control unit. Discover Paoli’s hydraulic range! Write us at info@paoli.net. Paoli wants to wish you and your families a Merry Christmas and a Happy New Year. Paoli continuously invests in training and technology, in order to offer to his customers original solutions and groundbreaking products. We love to support who, like us, knows that education, experience and research are instrumental in the achievement of results. That is why we chose to sponsor Unipg Racing Team: a project, conducted by a team of students of the University of Perugia, whose purpose is to realize racing car prototypes. The first prototype, named RB11.1, made his debut in the Italian Formula SAE in 2013, placing itself in the middle of the ranking table during the race at the Varano de’ Melegari Autodromo. The production of the current prototype started in 2014: the RB 11.2. Thanks to the engineering developments and the optimizations during the planning stage, the team has significantly increased its general score, compared with the previous year, during the annual Italian Formula SAE appointment. The racing cars, realized at the University of Perugia labs in cooperation with a local workshop, must pass strict controls and prove to be efficient in performances, fuel consumption and reliability in order to race. Supporting Unipg Racing Team is, for Paoli, an important opportunity to contribute to the success of a group of students who work hard daily to produce competitive and well-performing prototypes. From July 28th to 31st, at Spa-Francorchamps circuit, Belgium’s oldest racetrack, will be held one of the most important endurance races of the season: the Total 24 Hours of Spa. The 68th edition of the event will see 65 teams challenging each other on the starting grid. In addition to the awaited Blancpain GT Series, the prestigious Belgian track will also host the European Formula 3 Championship, the Lamborghini Blancpain Super Trofeo and the Formula Renault 2.0 NEC. Paoli couldn’t miss the opportunity so, with our partner CaseLiner, we will be there during the entire weekend, offering our support to the teams, supplying also accessories and spare parts. Furthermore, the Total 24 Hours of Spa will be an important occasion to see in action our new Paoli Sockets F488, which, along with the Lamborghini Huracán, are a recent addition to our company sockets range. The new Paoli Sockets are the outcome of the most advanced engineering research. Design blends with technology, creating a reliable and performant product with an unique style. Are you ready for a weekend full of adrenaline? We are looking forward to see you at the 24 Hours of Spa! Concentration, speed, training: Pit Stop is an art. Paoli knows it. This is the reason why we took inspiration from the works of some famous artists and decided to periodically show to you our re-visited versions, where Paoli’s wheel guns and accessories are the main characters: essential elements for the perfect tire change. Paoli: the Art of Pit Stop. It is difficult to express the feelings of a Motorsport race. Maybe it is the adrenaline, maybe the exciting environment or the engine roars, but the racing world always succeeds in getting its public involved. There is a great passion that bonds together the champions and their viewers. The supporters, however, usually don’t know what happens behind the scenes of every competition: the preparation, the technicians groundwork and the commitment of companies that actively contribute to the pilots and racing teams efforts and successes. Paoli is part of this world, where our products play a prominent role: tire changes require speed, accuracy and advanced technologies. Every split second becomes precious for the perfect pit stop. This is the reason why the company constantly invests in research and training, in order to supply the best well-performing solutions to the racing teams. Paoli knows well that at a 350 km/h speed, it is the details that make the difference between victory and defeat. It is time to open the pit boxes: the show is about to start. Live it with Paoli!